A Senate panel on Tuesday said it would not accept efforts by President Donald Trump to ease sanctions on Chinese smartphone maker ZTE. In a vote of 23 to 2, the Senate Banking Committee overwhelmingly approved an amendment that would block Trump from reducing penalties on ZTE without first providing Congress proof the company is following US laws. The panel's defensive action follows media reports that the Trump administration and China are nearing a deal to relax sanctions on ZTE in exchange for trade concessions from Beijing. "If the president and his team won't follow through on tough sanctions against ZTE, it's up to Congress to ensure that happens," Senate Minority Leader Charles Schumer, a New York Democrat, said in a statement. "Both parties have come together today to strongly rebuke ZTE and the administration's soft approach." The amendment, crafted by Democratic Senator Chris Van Hollen, was part of a broader bill that would give US regulators more power to block foreign investment in the United States. The bill passed the panel 25-0 and now advances to the full Senate for a vote. "Good news: My amendment to stop President Trump from unilaterally exempting ZTE from penalties for their repeated violations of our laws passed the Banking Committee on a bipartisan basis. Glad the Senate is putting America's national security first, not jobs in China," Van Hollen said in a tweet on Twitter. At the White House on Tuesday, Trump told reporters his administration is reconsidering penalties on ZTE as a "favor" to the country's president, Xi Jinping. He said he might impose a bigger penalty on the company instead. Trump did not say whether a deal had been struck with China. It was not immediately clear whether he was referring to ZTE or broader trade negotiations. Trump said he could "envision" a "very large fine" of up to $1.3 billion imposed on the company plus a requirement to appoint a new board of directors. The United States last month blocked ZTE from buying parts from American companies for seven years. ZTE relies on US tech for its products, sourcing chips from companies including Qualcomm (QCOM) and Intel (INTC). The ban brought ZTE's factories to a standstill. Beijing had been pressing Washington to lift the ban, and President Trump said last week he was willing to help ZTE get back into business. Senator Mike Rounds of South Dakota dismissed the characterization that the panel's vote was a rebuke of Trump. "I don't look at it that way," Rounds told CNN. "It's a matter of sending a message about how strongly we feel about national defense and about a telecommunication company and how critical that is to national infrastructure but I do not see it as a rebuke." At a separate hearing on Capitol Hill, Treasury Secretary Steven Mnuchin defended Trump's request to ask the Commerce Department to take a second look at remedies imposed on ZTE. Mnuchin said the president's directive is not "a function of backpedaling," but rather is similar to other times world leaders have called on Trump to discuss business matters. "This was not a quid-pro-quo or anything else," said Mnuchin testifying before the Senate Appropriations Committee on the agency's budget request. "This was merely President Xi asking President Trump to look into this, which he's done. Any changes to this will fully support the mandate of making sure our sanctions and our technology are protected." 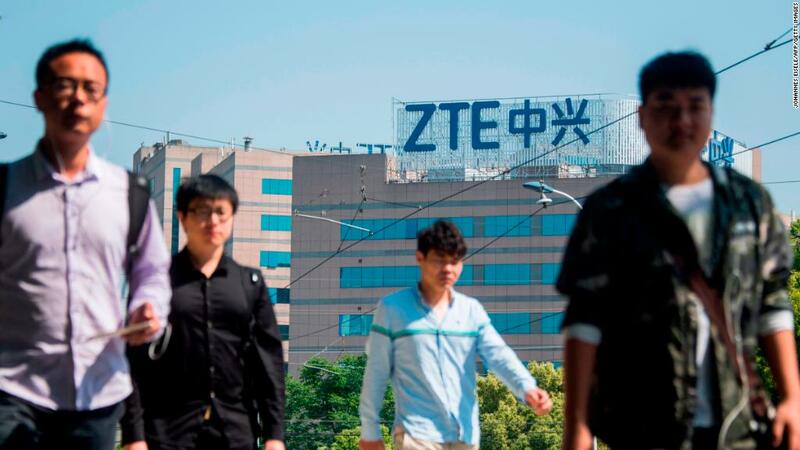 US officials said they imposed the ban last month because ZTE failed to comply with the terms of a deal last year under which it admitted to violating sanctions on Iran and North Korea. Commerce Secretary Wilbur Ross said last week the administration is exploring "additional remedies" to its harsh punishment of the Chinese smartphone maker. Mnuchin said any future decisions were in the hands of the Commerce Department given that ZTE is an enforcement case. But he stressed the administration takes national security concerns seriously. "I can assure you whatever the Commerce Department decides, the intelligence community has been part of the briefings and that we will make sure we will enforce national security issues," he said. He declined to comment on what alternative remedies Commerce may be considering. "The objective was not to put ZTE out of business. The objective was to make sure that they abide by our sanctions programs," said Mnuchin. The US initially fined ZTE $1.19 million in March 2017 for violating sanctions against Iran and North Korea. But it then went a step further to impose a seven-year ban on US companies buying and selling ZTE products. Correction: An earlier version of this article incorrectly referred to Senator Charles Schumer. --CNN's Ted Barrett contributed to this report.